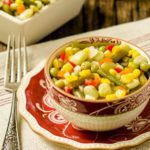 A recipe for Vegetable Salad made with corn, green beans, peas, lima beans, onion, bell pepper, and pimentos. A simple dressing marinates it overnight. Heat vinegar, oil, sugar, salt, and pepper in a small saucepan until the sugar dissolves. Remove from heat and cool to room temperature (about 30 minutes). *Note: If you want to substitute the oil, use one that will not solidify when chilled. Put corn, lima beans, green beans, peas, onion, bell pepper, and pimento peppers in a large bowl. Toss to combine. Pour dressing over vegetables and toss again. Cover and chill overnight, stirring occasionally. Bring salad to room temperature prior to serving (about 1 hour). You can use fresh, frozen, or canned vegetables. Make sure they are cooked to your preference, drained, and at room temperature when making the salad. Time stated does not include cooking vegetables or chilling the salad overnight.